In 1991, an undergraduate Finnish computer science student, Linus Torvalds, had a surprising idea: he began to write a new operating system on his PC. His initial goal was to be able to try some things that weren’t possible with the operating systems then available to him. After several months of tinkering, Torvalds noted that he had developed a system that could be useful for others too. He announced his work on the Internet and asked for feedback about features that people would like to see. Some weeks later, he put the software online. Now anybody could download and use his code. It was also possible to adapt it to better fit your needs, if you knew how to program. The software was met with enormous interest, since the operating systems available at that time offered limited possibilities or were very expensive. And they were developed in companies that normal users couldn’t influence. That someone used the Internet to develop an OS, explicitly inviting people to join his efforts and freely sharing the results, was unheard of. Only two years later, more than 100 people were helping develop the software now called Linux (a wordplay on “Linus” and “Unix”). Richard Stallman’s GNU Project was another initiative that had already developed a number of useful system components. The combination of the GNU tools with the Linux kernel resulted in an operating system that was both useful and free. The success of GNU/Linux is based on the fact that – like all free software – it is a commons that everybody can use, improve and share. The freedoms that make free software a commons were first defined by Richard Stallman in the 1980s. He designed the GNU General Public License (GPL) as an exemplary license to legally protect these freedoms. The GPL (also used by Linux) remains the most popular free software license.2 Another crucial factor is the community that coordinates the development of the operating system. The open, decentralized, and seemingly chaotic way of working together pioneered by Torvalds and his collaborators became known as the “bazaar” model of software development (Raymond 2001). It contrasts with the top-down, hierarchical, meticulously planned “cathedral” style of development, once used for erecting the medieval cathedrals but also characteristic for software development in many companies. With free software, there is no strict boundary between users and developers. Many participants simply use the software, but some help to improve it, either occasionally or even regularly and intensely. The participants themselves decide whether and how to contribute. Participation is not obligatory, but quite easy if you want to get involved. If you deviate from the customary practices and community guidelines, you risk being “flamed”: others may publicly and harshly point out your inappropriate behavior. That’s the worst that can happen; more severe sanctions such as formal exclusion are very rare. The General Public License ensures that these four freedoms are preserved in all future versions of a software program. If I modify and distribute a GPL’ed software, I must publish my own version under the GPL. This principle is called “copyleft” since it turns copyright on its head. Instead of granting exclusive rights of control and exploitation to the authors, it ensures that all versions of the software will remain in the commons forever. In contrast to companies and entities in planned economies, peer projects don’t have command structures. That does not mean that they are unstructured; on the contrary, most projects have “maintainers” or “admins” who keep the project on course and decide which contributions to integrate and which to reject. However, nobody can order others to do something and nobody is forced to obey others. The participants are “peers”: they voluntarily cooperate as equals and no one is subordinate to anybody. Jointly they develop the rules and forms of organization that are most appropriate for their cooperation. Open hardware projects design physical products by freely sharing blueprints, design documents, and bills of materials.8 In the field of electronic hardware, the Italian Arduino project is especially well known. Many other projects use or extend its products. Free furniture designs are created by Ronen Kadushin and by the SketchChair project. The Open Architecture Network and the Architecture for Humanity project design buildings whose purpose is to serve the needs of their inhabitants, rather than making building companies rich or architects famous. OpenWear is a collaborative clothing platform that supports people in becoming producers and finding collaborators. Wireless community networks organize freely accessible wireless networks in many parts of the world. The Open Prosthetics Project develops prosthetic limbs. It was started by a former soldier who had lost a hand in war and was unable to find a commercially available prosthesis suiting his needs. A special goal of the project is to improve the medical treatment of people who cannot afford to pay a lot, e.g., in the Global South. The openness of open hardware generally leads to a high number of adaptations and variants, since everyone can participate and contribute their own improvements. Hence, whatever your taste or needs, it’s not unlikely to find that some other person with similar preferences has already created a suitable variant and published it online. This enhances the chance of finding solutions for specialized, niche needs neglected by commercial players because the expected profits are too low. You cannot create things from designs and blueprints alone – physical resources and means of production are needed as well. Technological advancements have made various production processes less expensive and more accessible. Today, hobbyists and peer projects can utilize machines they built for themselves or bought inexpensively to produce items whose production would have required capital- and labor-intensive factories just a few decades ago. Of course, it is neither possible nor reasonable for everyone to have all the equipment necessary for production in his or her own basement. It makes more sense for productive infrastructures to be community-based, i.e., jointly organized by the inhabitants of a village or neighborhood. There are already examples of this. For example, the inhabitants of the South African town Scarborough set up a decentralized “mesh network” that allows them to access the Internet and the telephone network. Necessary equipment such as wireless routers are bought by individual citizens. No single person or entity owns the network or large parts of it, and therefore nobody is in a position to shut it down or censor it. The networks run on free software and a large part of the equipment is developed as open hardware. Community-organized production places are emerging as well. The global Fab Lab network spans over 50 cities on five continents. Fab Labs are modern open workshops whose goal is to produce “almost anything.” That’s not yet realistic, but they can already produce furniture, clothing, computer equipment (including circuit boards), and other useful things. So far, Fab Labs mostly employ proprietary machines whose design is not open, making it impossible for people to produce their own versions or to improve them. But parts of the community are trying to overcome this limitation. Their goal is the creation of an entirely commons-based production infrastructure, a network of free and open facilities that utilize only free software and open hardware. This would pave the way to lessening people’s dependency on the capitalist market, with commons-based peer production producing more and more of the things that people need. But can peer production really get that far in the physical world? Won’t it be stopped by the fact that natural resources and the Earth’s carrying capacity are limited? It would be impossible to produce and use seven billion cars (one for everybody) – the required gasoline would quickly exhaust the Earth’s remaining oil reserves, and the resulting CO2 emissions would dramatically accelerate global warming (Exner et al. 2008). However, producing bicycles or e-bikes for everyone should be possible without breaking the limits of the Earth’s carrying capacity. And it should be equally feasible to produce other things in sufficient quantity that don’t require too many resources. Things that are quickly thrown away won’t satisfy more needs than things that you keep longer. Commons-based peer production brings such a needs-driven conception of plenty for everyone into reach. It’s not things that matter, but needs: the important point is not whether I have a car, but whether I’m able to freely move to other places and interact with other people. Physical production is impossible without natural resources. Therefore, peer production won’t be able to realize its full potential unless access to resources is managed according to its principles. Digital peer production treats knowledge and software as a commons. Likewise, physical peer production needs to manage resources and means of production as commons, utilizing them in a fair and sustainable way and preserving or improving their current state. For this it is important to find modes that ensure that nobody loses out and that everyone’s needs (whether productive or consumptive) are taken seriously. The challenge is huge, but the unexpected success stories of peer production— such as GNU/Linux and the Wikipedia—show that peer production can achieve a lot. And the long history of the commons contains many examples of the successful long-term usage of natural resources and of the successful management of user-built infrastructures. For the future of commons-based peer production it will be very important to bring together the perspectives and experiences of commoners from all areas – whether “digital,” “ecological,” or “traditional.” They can learn a lot from each other. Exner, Andreas, Christian Lauk and Konstantin Kulterer. 2008. Die Grenzen des Kapitalismus. Ueberreuter, Wien. Raymond, Eric. 2001. The Cathedral and the Bazaar. O’Reilly, Sebastopol, CA, 2nd edition. Siefkes, Christian. 2011. “The Emergence of Benefit-driven Production.” In Proceedings of OKCon 2011, Berlin. http://www.keimform.de/2011/benefit-driven-production. 2. Regarding alternative licenses and their compatibility with each other, see Mike Linksvayer’s essay on pp. 299–304. 3. For an extensive discussion of peer-to-peer production, see Michel Bauwens’ article in this volume on pp. 323–330. 4. See The GNU Project (2010). The Free Software Definition, at http://www.gnu.org/philosophy/free-sw.html. 5. 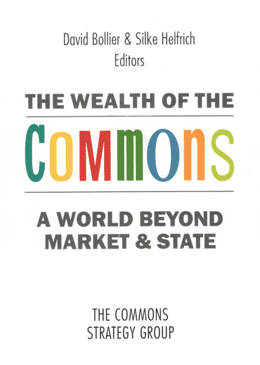 Commons are often hybrids of private property and public property that co-mingle private and joint use. See for example the essays by Liz Alden Wily (pp. 132–140) and Mayra Lafoz Bertussi (pp. 254-257). 6. For a detailed discussion of the differences between market logic and the logic of the commons, see Stefan Meretz’s essay (pp. 28–34) and Silke Helfrich’s chart of comparisons (pp. 35–36). 7. The degrees of freedom granted by the various Creative Commons licenses vary; not all of the licenses assure all “four freedoms” guaranteed by free software. See Mike Linksvayer’s essay on pp. 299–304. 8. See Benjamin Mako Hill’s essay on “open” versus “free” on pp. 305–308. 9. The author thanks Stefan Meretz for his help is compiling this project collection. 10. On the subject of plenty, see the conversation between Brian Davey, Wolfgang Hoeschele, Roberto Verzola and Silke Helfrich on pp. 102–110.